This page is dedicated to supplying readers with more information regarding South Africa's education statistics and will be updated periodically as more information becomes available. The article below was published by Statistics South Africa (Stats SA) and highlights the funding issues experienced by students, in particular those looking to attend higher education institutions. The report, which uses data from the General Household Survey (GHS) 2017, indicates that only 33,8% of youth aged 18–24 were attending educational institutions. Among those, 22,2% were attending school while 11,6% were attending post-school educational institutions. 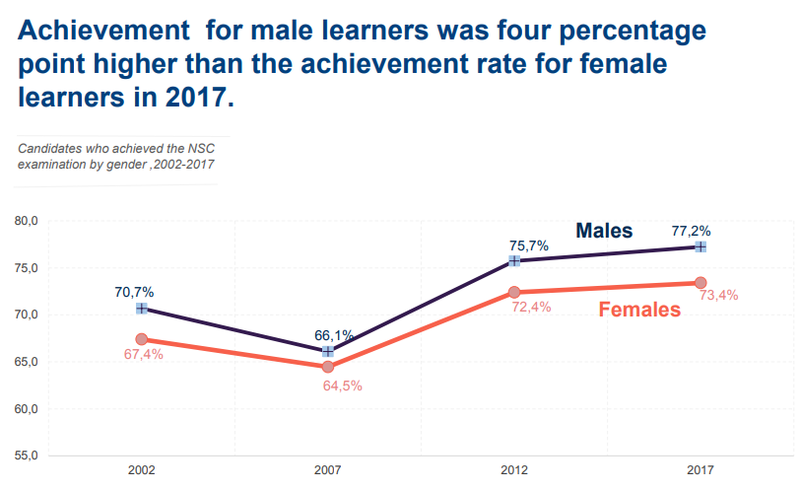 In 2017, only three-quarters of male students who attended Grade 10 in 2016 progressed to Grade 11, while the same was true for close to 87% of female learners. During the same period, even fewer males (71%) who attended Grade 11 in 2016 progressed to Grade 12 the following year, while 76% of the females did the same. The report shows that the general trend in participation in all institutions of post-school learning was upward, with total enrolment in higher education institutions in 2016 amounting to 49,9% of all enrolments within the sector; TVET colleges amounted to 30,8% of all enrolments; CET colleges 11,9% of all enrolments; and private colleges 7,4% of all enrolments within the sector. Despite gains in higher education participation rates, gender disparity was still a challenge, as was participation equity for students from low-income backgrounds. Female participation in 2016 at public higher educational institutions (universities) was 58%, and 57% at TVET colleges. Most students were enrolled in undergraduate NQF Level 7 programmes at universities, mostly studying for qualifications in the fields of business, commerce and management sciences, education or engineering. Most students enrolled at TVET colleges in 2016 were studying for Report 191 qualifications. NATED / Report 191 programmes are delivered under the auspices of the Department of Higher Education and Training and quality assured by Umalusi. The programmes consist of 18 months of theoretical studies at colleges and 18 months relevant practical application in work places. Engineering studies range from N1 – N6 while Business and Utility Studies range from N4 – N6. According to the report, the number of graduates from public higher universities more than doubled from 92 874 in 2000 to 203 076 in 2016. In 2016, the number of graduates from TVET and private colleges stood at 135 492. The time taken by students to complete their undergraduate qualifications also improved over time. However, the higher education system still has challenges in terms of their success rates and poor completion rates. Many students drop out without completing a qualification, or they take up to six years to complete a three-year qualification. Very few students progress to advanced NQF levels of study (NQF levels 8–10). Honours (19,8%), masters (6,3%) and doctoral studies (1,4%) accounted for a relatively small percentage of the overall tertiary qualifications awarded in 2016. According to the report, close to 47% of youth aged 20–24 years who held bachelor degrees or qualifications equivalent to NQF Level 7 came from the highest household income quintile. In comparison, only 7,4% of youth who held qualifications equivalent to NQF Level 7 came from the lowest household income quintile. Furthermore, close to 36% of youth holding postgraduate degrees or qualifications equivalent to NQF Levels 8–10 came from the highest household income quintile. Based on a education series document published by Statistics South Africa, mail learners tended to achieve better overall marks than their female counterparts. In 2017 males achieved almost 4 percentage points more on average than their female counterparts. See the image below. Ever wondered what percentage of those passing matric passed with grades good enough to be accepted to do a Bachelors degree at University? 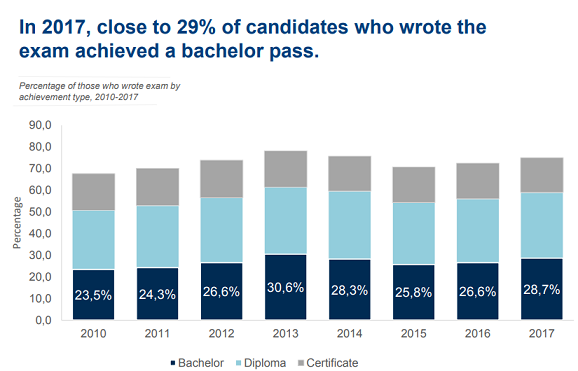 According to the data in 2017, 28.7% of those that passed passed with grades good enough to be accepted into University to study a Bachelors degree as the image below shows. In our update on 18 March 2018 we mentioned the problem South Africa has with NEET, those youths not in employment, education or training. 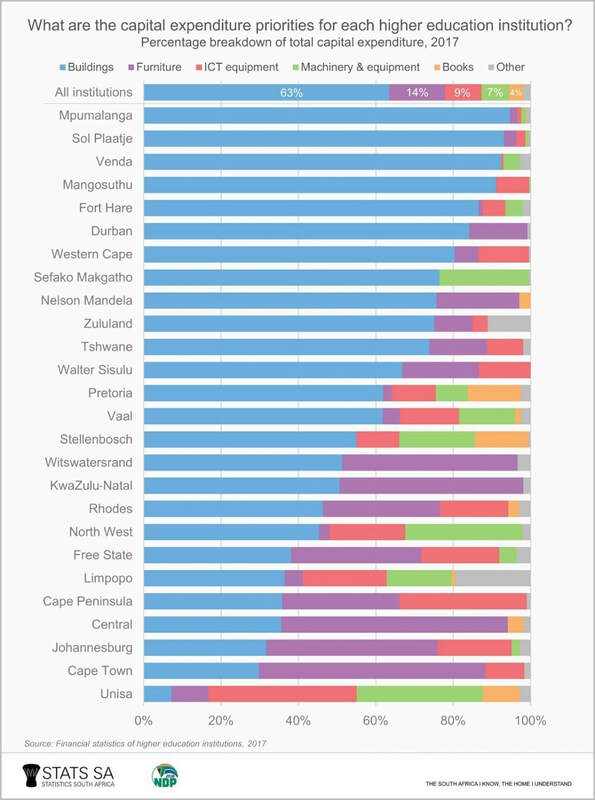 Well the image below assists in highlighting the NEET problem in South Africa. 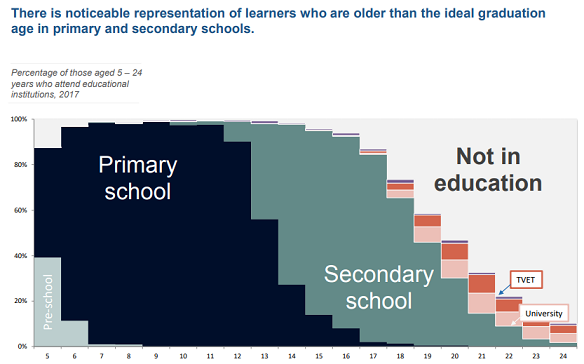 The grey block to the top right which says Not in Education is a large comprised of those not in employment, education or training. It also shows a large chunk of those falling under NEET belongs to the age group 23-24 year olds. And at the end of the day it seems education is all about the money. 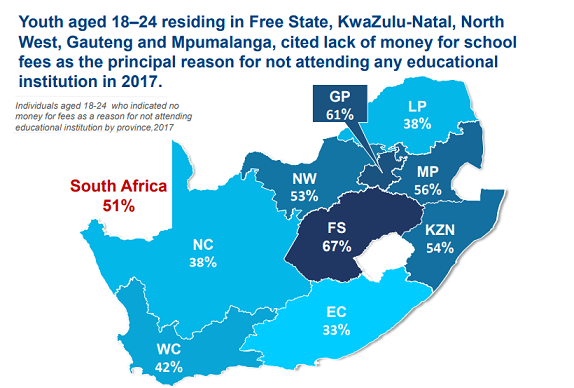 ​Youth aged 18–24 residing in Free State, KwaZulu-Natal, North West, Gauteng and Mpumalanga, cited lack of money for school fees as the principal reason for not attending any educational institution in 2017. For South Africa as a whole 51% of youths (aged 18 -24) said money is the main reason they are not attending an educational institution in 2017. The map below shows the percentage of youths per province who cited money as the reason for not attending an educational institution. According to the report released by the commission of inquiry into the provision of free higher education, South Africa has a significant NEET problem. NEET is a acronym used to describe a certain subset of youths in South Africa. Not in employment, education or training (NEET). So its those youths who are unemployment, not studying further (after school) and not currently receiving any form of training to get them into the jobs market. The funnel graphic below shows South Africa's NEET problem. In 2014 South Africa had 3 million youths between the age of 18-24 who was classified at NEET. 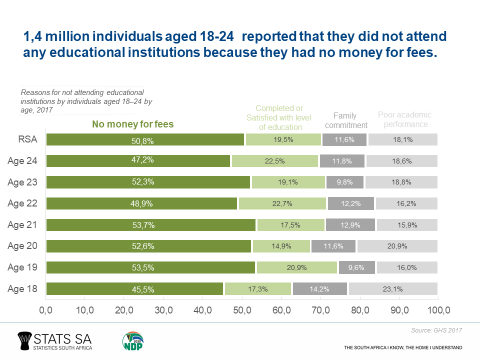 The sad reality is South Africa doesn't have enough education facilities to accommodate all these youths, neither do they or their parents have the money to get them into higher education and training facilities such as Universities or technical schools. Problem this creates is the fact that a large part of these youths will turn to crime, drugs etc to feed themselves and their families, leading to even bigger social problems in South Africa. If you in a University of receiving further education and training and you are between the age of 18-24 be very very grateful as there are millions less fortunate than you. In this update we take a look at the numbers provided by the Department of Basic education regarding the number of public and independent schools, learners in public and independent schools as well as the number of educators in public and independent schools. And the numbers for public schools are extremely worrying. So lets compare the numbers. In public schools, there are 31.3 learners per educator and on average 524 learners per public school, while for independent schools there are 11.8 learners per educator and on average every independent school has 204.5 learners. So far more students attending at the average public school, and almost 3 times as many learners for each public school educator to deal with than those working at independent schools. In this update we take a more detailed look at the enrollment and pass rate numbers for three subjects we are very keen on on this website, which is economics, mathematics and accounting. Just how many students are enrolling for these exams and what percentage of students actually pass these subjects? We take a look below. So how many of the students actually enrolled passed the subject (based on the department's pathetic pass rate measure of 30%). Basically the department is saying if you only know 1 out of three answers you passed. A shocking indication of just how poor the standards of education is in South Africa. And its no surprise the "pass rate" as reported by the department is so high, it is due to the criteria for passing being so low. In 2018 the following "pass rates" where achieved when using the 30% "pass" mark. In 2018 the following "pass rates" where achieved when using the 40% mark as a "pass"
We as South Africans need to take a long hard look at these numbers and ask how are we ever going to be competitive against other countries in terms of education levels and giving our children a fair chance in the ever increasing open jobs market when marks like these are achieved? Our current levels of education is surely the single biggest problem that needs to be addressed in South Africa if it is to give its citizens a fair chance at employment. The following is quoted from the Minister of Basic Education's speech at the launch of the 2018 matric results. For the past eight years, we have noted that the NSC pass rate has consistently been above the previous 70% glass ceiling. The Class of 2018 must be commended for maintaining this trend. They are the fourth largest cohort in the history of basic education to register for any NSC examination in the country. The 2018 NSC overall pass rate, with the progressed learners included, stands at 78.2%, a 3.1% improvement from the 75.1% achieved in 2017. This, represents 400 761 candidates, who had passed the 2018 NSC examination. However, with the progressed learners excluded, the 2018 NSC overall pass rate stands at 79.4%, a 2.9% improvement from the 76.5% achieved in 2017. Well done to the Class of 2018!!! the number of candidates who passed with a National Senior Certificate (NSC) is 99; and the number of candidates who passed with an endorsed NSC is 129. So of the 800 800 students who registered for the NSC exams, only 172 000 qualified for further studies at universities. So just over a third of the students that wrote matric actually qualify to go to university. While the department of basic education might brag about the impressive pass rate (which is impressive due to the fact that the score required to be deemed a pass) keeps being lowered and lowered. So no wonder the percentage of students passing keeps on increasing. Students who do not qualify for varsity will struggle to get employment in South Africa without a degree. And if they do get work without a degree it will not be a decent paying job. They will be working for peanuts. So the actually the matric results is a complete failure and the department of basic education has let thousands upon thousands of students down. In 2016 there was around 1.2 million people in grade one students. If the same amount of grade 1 students were in grade 1, 12 years ago, it means that only about 30% (400 000 odd that passed divided by the 1.2 million in grade 1 now) of pupils who start school in grade 1 actually make it all the way and pass matric. That department of basic education is absolutely nothing to be proud of. Look at it this way, in 2016 there were 1 067 075 pupils in grade 10. And only 400 761 passed matric. So that is a pass rate of 37.56%. Basically only 385 of pupils that were in grade 10 in 2016 passed matric in 2018. A shockingly bad figure that the department should be ashamed about. So ever wondered how Marcus Jooste and his gang of thieves got away with their elaborate accounting and fraud schemes at Steinhoff? 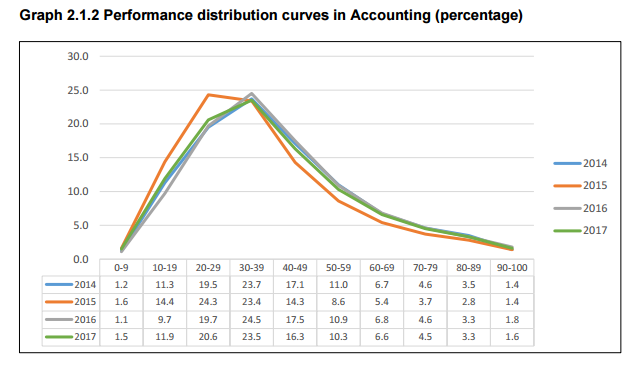 Well the scores of matric students in the subject of accounting tells a very concerning picture. In 2017, 103 427 students wrote the matric exams for accounting. and only 44 041 students scored more than 40% in accounting. That means that less than half the students that wrote the accounting exam scored more than 40%. And 40% is still a fail in our book. Now if basic accounting such as school accounting cannot be teached/grasped/mastered by school kids how are they (when they become CA's and auditors) expected to pick up large scale fraud as was the case at Steinhoff with loads of off balance sheet transactions, over valued business valuations and the like? The table below shows the overall achievement of South African matric students in Accounting for the last couple of years. The line graphic below shows the percentage of students that scored within each 10% range for accounting over the last couple of years. If distinctions are seen as scores above 80%, then only 4.9% of matric students that wrote Accounting received distinctions for it. Expect loads more accounting scandals to come out in coming years if this is the quality of Accounting in South Africa. Worrying for future higher education students is the fact that these institutions are cutting back on their capital spending, as the article published by Statistics South Africa will show. Perhaps these institutions are cutting back on such spending, as they know with the next protest regardless of what it is about will result in destruction of property and assets, so why upgrade, maintain or fix them when it will be damaged again? Below the article from Statistics South Africa (Stats SA). "Capital expenditure by South Africa’s higher education institutions continued to fall, for the second consecutive year. The country’s 20 universities and 6 universities of technology recorded a 5,4% drop in capital expenditure in 2017 compared with 2016, falling from R6,22 billion to R5,89 billion. This followed a 0,7% drop in 2016, according to Stats SA’s recent Financial statistics of higher education report. Capital expenditure is money that an institution spends to acquire, maintain or upgrade fixed assets such as buildings, land, equipment, vehicles and furniture. These assets generally increase the capacity and efficiency of the institution, and usually have a life span of longer than a single accounting period. The amount that an institution spends on fixed assets shows the extent to which it’s investing in the long term. 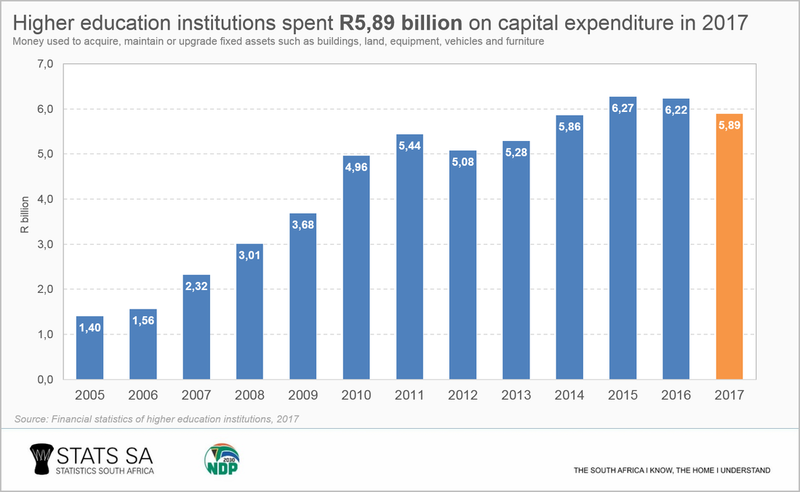 The drop in higher education capital expenditure mirrors the pull-back in spending on fixed assets by the public sector. Stats SA’s Capital expenditure by the public sector report for 2017, drawing on financial data from 751 institutions, recorded the first annual decline in public-sector capital expenditure since 2010. Subdued spending on plant, machinery, new construction works and transport equipment was largely the cause of the fall. In terms of higher education, the 5,4% drop in 2017 was largely a result of decreased spending by the University of the Witwatersrand (Wits), the University of South Africa (Unisa) and the Walter Sisulu University. These three institutions spent less on buildings, transport equipment, office furniture and other machinery and equipment. Capital expenditure priorities differ across institutions. The University of Mpumalanga spent 95% of its capital expenditure on buildings, while Sol Plaatje University spent 93%. In contrast, Unisa spent a small proportion on buildings, instead focussing on ICT equipment and machinery and equipment. The decrease in overall capital expenditure can be attributed to various reasons. Wits, for example, indicated that it had reduced capital expenditure in order to conserve money for increased maintenance costs. The institution would also redirect any surplus cash towards its insourcing programme, the process of absorbing staff that were previously employed by third-party contractors. This update takes a look at the results of the latest General Household Survey (GHS) published by Statistics South Africa and the information relating to education. The table below published by Statistics South Africa shows various metrics related to education. The worrying number from the table above is the Repetition rate (RR) of Grd 10 's which is sitting with 22.5%, basically saying 22.5% of households in South Africa reported they have a child repeating Grd 10 and 20.5% of households stated that they have a child repeating Grd 11. Note the results of the GHS is based on a sample of households selected. There will therefore be some bias built into the numbers (selection/sample bias), reporting bias etc. The numbers above are therefore the best estimate of the population as a whole based on the selected sample. The table below is a continuation of the table above, showing additional metrics related to education in South Africa. In total 11.4% of households reported children work for longer than 30 minutes to the nearest school. 22.2% of households in KwaZulu-Natal reported children work for more than 30 minutes to get to school, while only 1.2% of households in the Western Cape reported children walked more than 30 minutes to get to school. 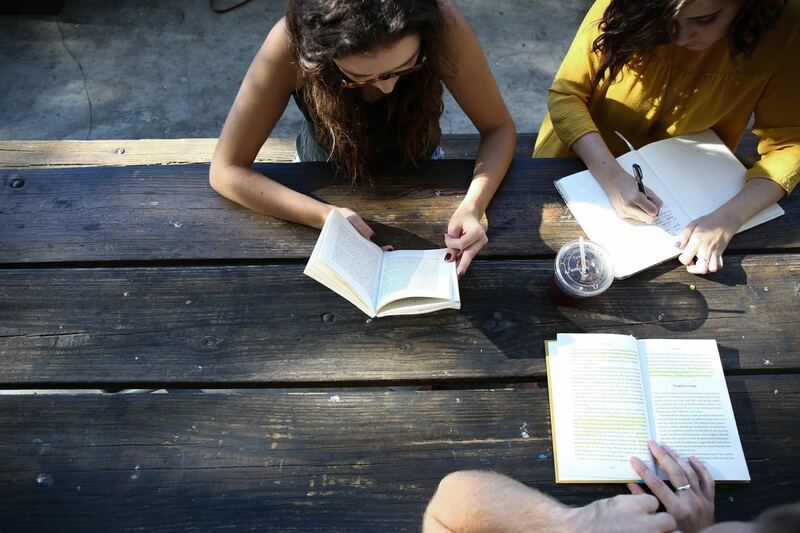 Another worrying statistic for South Africa is the adult literacy rate, which is defined as people over the age of 20 with Grd 7 as the highest level of education is sitting at 13.8%. The province with the highest adult literacy rate is the Eastern Cape (20.5%), closely followed by Limpopo (19.7%) and Northern Cape (19.1%). When looking at the graphic above readers should note that the scale is logarithmic. Thus it increases 10 fold to the next value. So while it looks like North West university has student numbers not that far off from UNISA, UNISA has almost 5 times more students enrolled with them than the next biggest higher education institution which is North West university, closely followed by Tshwane University of Technology (TUT). However UNISA has seen its numbers decline by roughly 10% from 336 000 in 2016 to just under 300 000 in 2016. UNISA is not alone in this. University of Pretoria (TUKS), Vaal and University of Limpopo have seen similar declines in student numbers over the last 4 years. On the opposite side there is University of Venda (Univen) which has shown incredible growth with numbers rising from just over 10 000 in 2012 to over 15 000 in 2016 (almost 50% increase in student numbers over a 4 year period). Central and WITS have also shown steady growth in student numbers over the period in question. 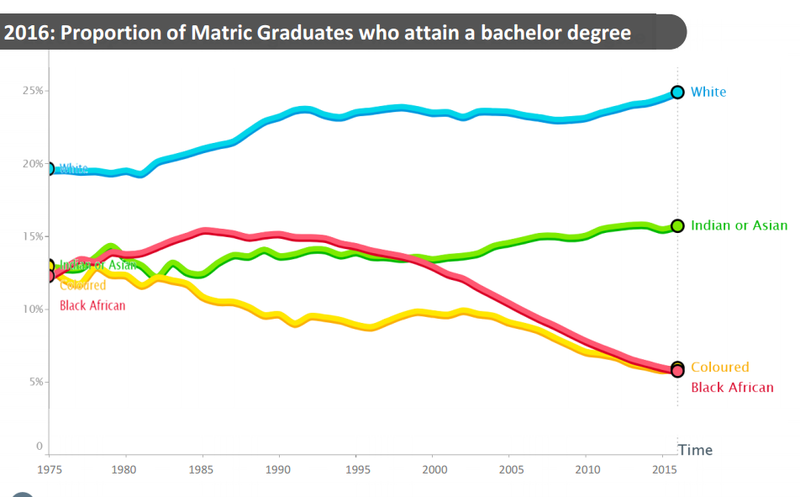 The image below shows the number of students graduating from the various higher education institutions over time. Encouraging to see is the fact that the numbers are increasing, but is this due to the increase in number of students or better pass rates being achieved? While the number of students enrolled has increased by 2.4% from 2012 to 2016, the number of students that graduated has increased by 22.3%. 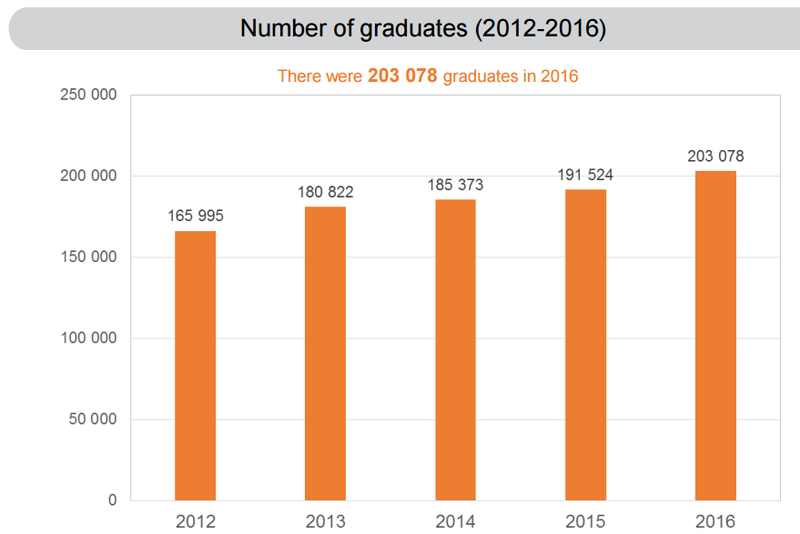 Clearly showing number of graduates increasing is not just due to the number of students increasing. The image below shows the total value of grants paid by national government to various higher education institutions. And it is clear to see that grants paid increased sharply after the #feesmustfall campaign. Interesting to note that the growth in grants paid is growing a lot faster for Universities compared to University of Technologies. While we mentioned earlier that University of Pretoria (TUKS) showed a decline in student numbers, the graphic below shows that it has not detered TUKS from spending money on upgrading their facilities and equipment (as their Capex spending accounts from over 10% of total capital expenditure by all higher education institutions. Surely this bodes well for the quality of education at TUKS, is there are less students yet better facilities and equipment. 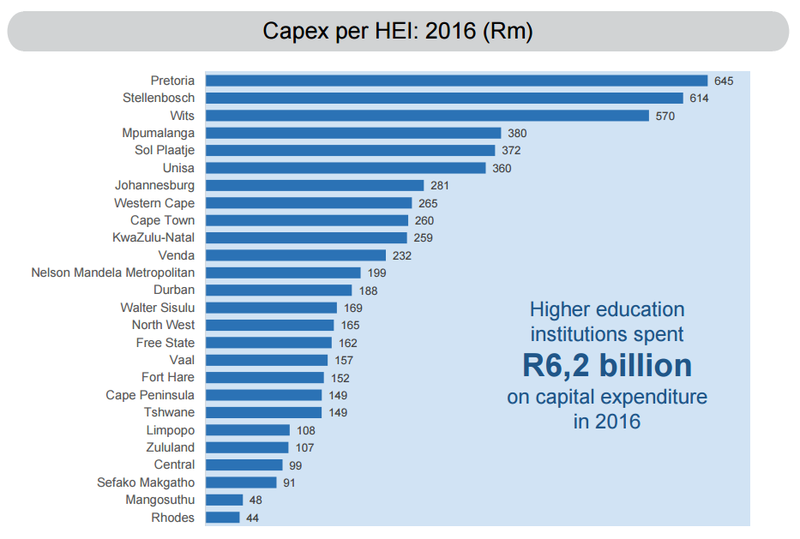 Stellenbosch University and WITS makes up the rest of the top three when it comes to capital expenditure by higher education institutions. The image below shows the percentage of students per race group that go on to obtain a bachelors degree after matriculating. And it is clear that white students as a percentage of the race group makes up the highest percentage of students who obtain a bachelors degree. Various factors contribute to this and we will touch on them below the image. White students parents are more like to afford better primary and secondary schooling, and more likely to be able to pay for tertiary education, hence the higher percentage of white students obtaining bachelors degrees after matriculating With around 25% of white students obtaining a bachelors degree after matric, Indian/Asians comes a distant second with around 15% while both Coloured and Black Africans sitting around 5% of students obtaining a bachelors degree after matric. Concerning to see is the decline in the percentage of Coloured and Black African students obtaining bachelors degrees after school. Again part of this is due to a lack of funding from these race groups, making it harder for students from these groups to enter a higher education institutions. And this is part of the reason for the whole #feesmustfall campaign that swept across South Africa. The funnel chart below is based on statistics from the Basic Education Department. It shows the number of learners registered per grade in South Africa. What is concerning to note that around 1,2 million learners are registered for Grade 1. Yet only 680 000 odd makes it to Grade 12. 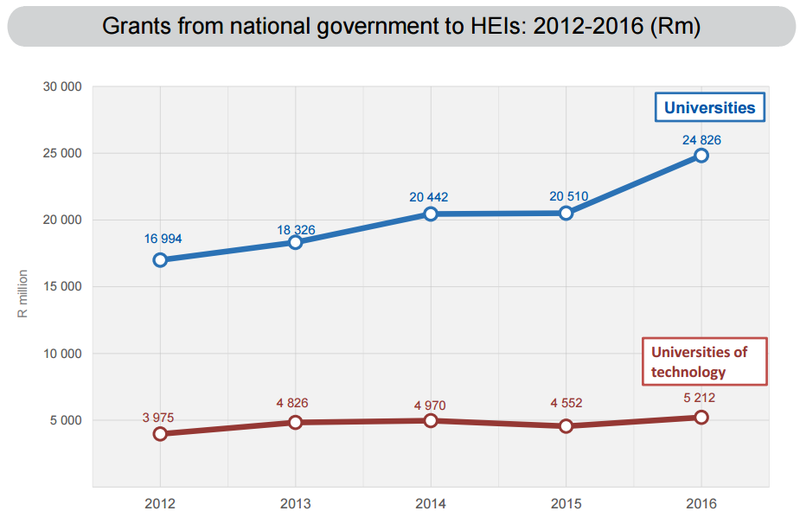 Data from the Department of Higher Education showed the number of new graduates that registered at Higher Education Institutes (such as Varsities, Universities of Technologies etc.) coming in at 158 000 in 2013. Thus assuming all the new registrations were matriculants of the the previous year (which roughly totales 700 000) , only 22% of martriculants or about 1 in 5 makes it to Higher Education Institutions (HEI) after school. Looking at it a little differently, only 12% (or around 1 in 9) of school children entering grade 1 will make it to HEI if this trend continues. This is a serious concern as the higher the level of education the greater the chance of being employed.